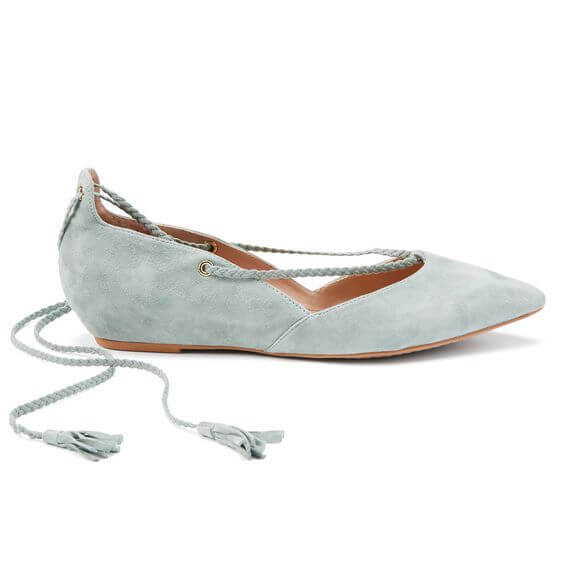 Both casual and sophisticated, we couldn’t be more excited about this year’s hottest shoe trend: lace-up d’Orsay flats. And luckily, they are so versatile you have a plethora of pairing options. Style them casually: For casual, day-to-day wear, lace up your d’Orsays with a pair of cropped jeans, capris or gauchos. Showing a little ankle will ensure the adorable lace-up detail is visible. Not into a lot of crisscrossing up your calf? You can also tie the lace around your ankle a few times for a chic, understated look. Style them with shorts: Shorts are also great options to try with your new flats. As far as shorts, desert neutrals, white or distressed denim are great trends to think about trying alongside your d’Orsays. Style them with a LBD: Lastly, transform a night-out dress with a pair of black d’Orsay flats. These shoes are very feminine, so try wearing them with a flowy dress with a handkerchief hemline for a sophisticated yet girly look.